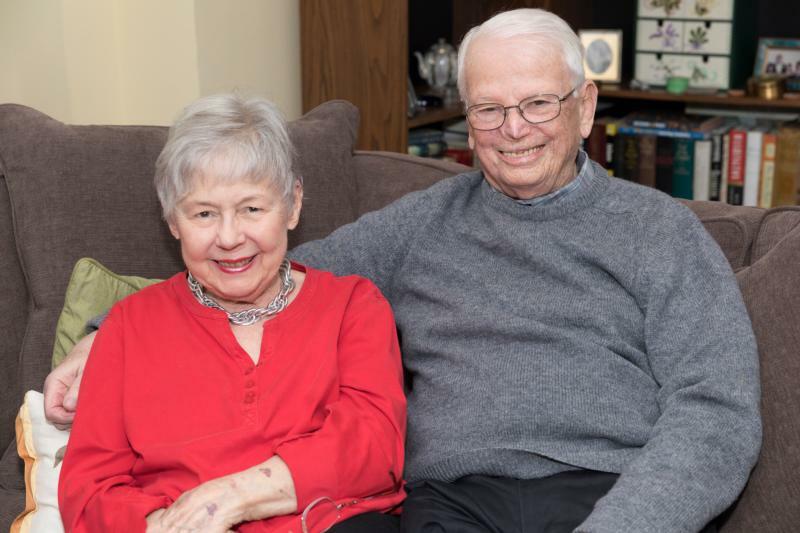 RYE, N.Y. (CNS) — Laughter, tolerance and shared faith are important ingredients in a loving, lasting marriage, according to a New York couple who will celebrate their 60th wedding anniversary at the end of National Marriage Week, which is Feb. 7-14. Bess June and John Lane reflected on their long relationship during a Feb. 6 interview at their home in suburban Westchester County. “We both came from Irish-American, Catholic families and the similarities help,” she added. John’s work as a network news producer and executive brought the couple and their young family to New York more than 35 years ago, but lingering accents confirm their Chicago roots. Bess June’s family belonged to St. Philip Neri Parish on the South Shore. She attended Catholic elementary and high school and graduated from the College of St. Teresa in Winona, Minnesota, before working as an advertising copywriter for a several Chicago department stores. John’s family was active at St. Margaret Mary Parish in Rogers Park on the far north side of the city. He also attended Catholic schools and graduated from Loyola University Chicago. John served two years in the Army, including a tour in Korea, and took a job with CBS News in Chicago. Mutual friends tried to introduce them, but they resisted because each was sure the other was “geographically undesirable,” according to the couple. “John was at 7500 north and I was at 7400 south,” a distance of some 20 miles, Bess June said. They ultimately agreed to have dinner with their friends at the Shoreham Hotel. They dated, broke up, resumed dating and became engaged in their mid-20s as, Bess June said, “we were approaching the ‘Single Blessedness Club,'” and were among the last of their friends to marry. Neither Bess June nor John seriously considered marrying anyone else. “Marriage is something I probably didn’t think much about, but it was time. Not only did I love her, I really liked her,” John said. “I felt I could be most myself with him,” Bess June said. They married Feb. 15, 1958, at St. Philip Neri. Their first child was born in 1960 and named Clement (“Clem”) in honor of John’s father. The senior Clem was city editor and later a columnist for the Chicago Daily News. “My father was an extraordinary example in my life,” John said. “He was the world’s greatest Christian. He was a daily communicant who was one of the founders of the Christian Family Movement and Catholic Action in Chicago and was one of the first members of Alcoholics Anonymous.” He also kept carbon copies of the almost-daily letters he wrote to John during his military service. John’s long career in the news business included stints with the Chicago Daily News, NBC News, CNN and WBBM, the CBS affiliate in Chicago. He spent 25 years at CBS and was the senior producer for the CBS News with Walter Cronkite from 1971 to 1980. By 1966, young Clem Lane was joined by three sisters. Bess June said, “Rent was cheap and so were cigarettes and booze. It didn’t take a lot of money to abuse anything.” By mutual agreement, the Lanes stopped drinking and smoking 53 years ago, they said. “I had a problem. I said to God, ‘Here’s my hand. Grab ahold’ and he grabbed tightly,” John said. Bess June said she knew her drinking “would never get better.” Quitting “saved everything,” she said. When John was transferred to New York, he said, he “interviewed pastors and Catholic school principals to find out if they believed in God and other minor stuff” before choosing a community. “I fell in love with Sr. Marion Duggan” at Resurrection School in Rye, he said. Perhaps the feeling was mutual: The late Sister of Charity baby-sat the four Lane children one weekend while the parents attended a wedding in Chicago. At Resurrection, the Lanes heard Jesuit Father Ned Murphy speak from the pulpit about Part of the Solution, or POTS, which was a storefront soup kitchen he started in the South Bronx. They began to cook and serve meals as a family at POTS every Saturday and help with large off-site Thanksgiving and Christmas feasts prepared and served by Resurrection parishioners for as many as 500 guests. “All of a sudden” they were “in charge of Thanksgiving and Christmas,” the couple recalled with a laugh. “We wanted our children to see what the real world is like. We got so much more out of it than we gave,” Bess June said. They organized food donations, preparation and volunteers for more years than they can recall and stopped only when they were sidelined by health issues. “I’m very proud that all have social consciences and they look out for people,” John said of his children and 10 grandchildren. The Lanes’ son died in 2011 after battling an undiagnosed condition for two years. Clem also worked in the television news business and was living temporarily with the Lanes after a move from California when he became ill.
John and Bess June are daily communicants. “It’s a wonderful way to start your day, examine your conscience and pray for people you love. If I don’t go to Mass in the morning, there’s something lacking in the day,” John said. At 87, John delivers food to needy families in a neighboring parish every Saturday. He and Bess June, who described herself as “almost 85,” consider themselves lucky. “We’ve been very fortunate. Our children are all normal, we’ve always had enough money to live and everything that happens to us now is age-appropriate,” she said. “Some people have real problems,” John said.